Panchkhal | Water We Doing? Bayaasi maa ke hola (What will happen in 2025)? We all get involved in casual discussion every now and then and end up agreeing or disagreeing on issues without any obligation to own it or be part of it. When such discussion focus on subject such as environment or climate change in which one does not need to provide immediate answers to or show proof of, the discussion can drag on inconclusively to many possible directions. As a result, we fail to connect ourselves with real world, or find a common agenda. In a way, we only waste time. But, sometimes while discussing issues without being seriously involved in, a sudden and unexpected casual question asked without much thinking can really set a point of reference for a serious discussion and force participants to look for answer that they would hardly have thought important. A similar thing happened last week when a group of masters level students of environment management faculty were visiting Panchkhal to observe the state of drying Jhiku Khola – the only stream that provide irrigation water to the farms in the valley – and the springs, and learn from farmers about the plight they have been facing. The purpose of the visit was also to meet farmers to learn about the ways they have adopted to cope with water problem. But before all of these, it was important to see if we really understand the problem. The objective was hence to see if we can try to understand what is going on in the local environment and what does drying water sources tell us. On our way to the valley, we stopped at several places on the mountain to meet people and examine water sources around their houses. The first thing that we noticed was a local tap up in the mountain that had gone dry after the Gorkha Earthquake. It was a confirmation that all the springs above that tap had dried following the quake. The villagers still expect the tap to have water after the monsoon, which needs to be seen after the monsoon. The good news was that the water level in a well dug two years ago little below the tap in a rocky place has increased. People from around that village used the well water to meet all their water needs. Further below at Tinpiple, the famous well located at the foot hill that had been under lock and key since last two years to save what little water it produced, had been left open since April 25 because the water level rose more than a foot immediately after the quake. With this picture of increased water level in the springs at the foot hill, we expected an increased flow in the Jhiku Khola as well. And so it was. When we reached the valley the Jhiku Khola was flowing high that day. 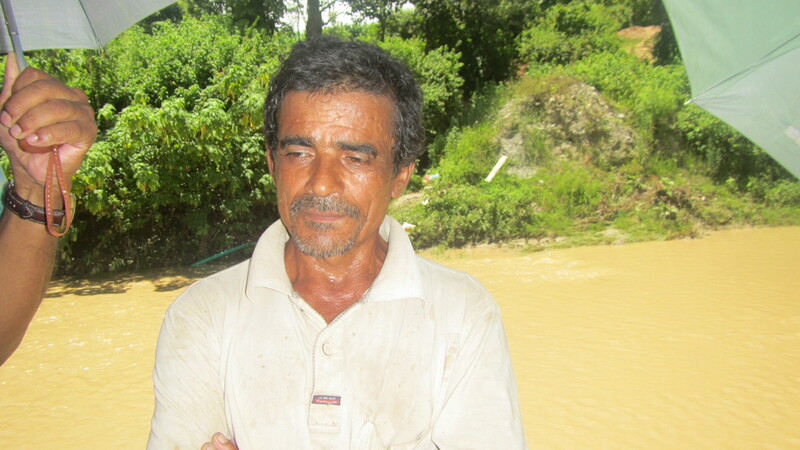 A farmer (seen in the picture below), who is fortunate to have his land near the bank of Jhiku Khola, was using a kerosene operated water pump to lift Jhiku Khola water to irrigate his paddy field. When we met the farmer, we were surprised to know that the Jhiku was dry until a day before and the water we saw was the first flowing water of this monsoon. Therefore, he was desperate to take it to his field. Before the flood, there were thousands of pits dug in the river bed in winter to collect water to irrigate. Each of these pits cost 10-15,000 rupees plus the operating cost of the pumps. Those, whose land are away from the river bank and cannot dig pits, need to pay 400 rupees per hour to pump water from these pits. Farming in Panchkhal has become more of an expensive and often frustrating venture to the farmers. Like elsewhere, farmers in the valley were all subsistence farmers before Panchkhal was connected with Kathmandu by Arniko Highway in the late 1960s. With the highway, came all sorts of development experts and projects to help farmers improve their lives. Commercial farming began. This farmer that we met, moved here, like many others, from Nala village in the early 1980s to do commercial farming. He was proud of his progress and continued his vegetable farming. But since the mid 1990s, the valley started facing water shortage. It was in 1995 (2052 Nepali year) that this farmer began using water pumps to pump water from the Khola when irrigation canals couldn’t bring enough water to his farm. Water shortage progressively deepened. By 2005 (2062 Nepali year) the Jhiku Khola hardly flowed in winter, and that is when farmers innovated this technique of digging pits in the river bed to collect seepage water for irrigation. Since then, thousands of pits are dug along the Khola every year. And yet, only those who are located close to the Khola get irrigation water from the pits, the rest in the upland do not. He explained that even the pits do not yield enough water as they did in the past. An indication that water source in the valley is declining progressively. In 2015 (2072 Nepali year) only limited farmers could irrigate their farms with water from the pits. The farmers hadn’t even finished saying this, a student suddenly asked ‘Bayaasi maa ke hola?’ (in Nepali, what will happen in 2025 (2082 Nepali year)?). We couldn’t possibly find any answer to this unexpected question – Bayaasi maa ke hola? But, as a society and as a nation we must have some clue of what will happen to water sources in 2025. Despite decade-long efforts of people to inform the policy makers and with years of repeated reporting on the water crisis, water shortage in Panchkhal has grown from bad to worse in the last 20 years between 1995 and 2015. We may indulge in series of research and discussions, debates and experiments, but if we fail (like we have in the past) to find answer, who will this farmer turn to in the next ten years?